The second day started way earlier than I had hoped. I woke up at 12:30am to the sound of water slapping against the hull. And wind. That sounds like a lot of wind! Checking the instruments, 22 knots! Will the anchor hold? To make matters worse, the wind had turned around making the beach north of the anchorage a lee shore. I was up until 4am monitoring the situation. The wind kept blowing at 20-22 knots and also making large direction changes every few minutes. Not a fun night! 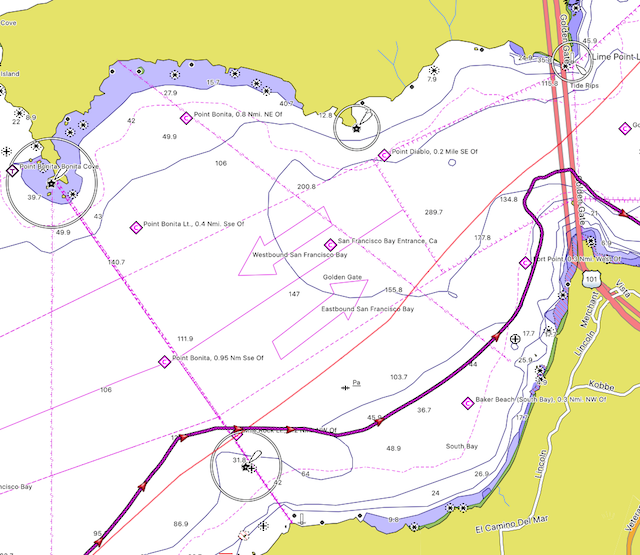 I had the anchor watch running on the primary chartplotter (which I can monitor on a tablet from the comfort of the aft cabin) and also on a handheld GPS as a backup. Fortunately the anchor never budged, the boat remained in a tight circle all night. Around 4am the wind decreased to 12-15 knots and I finally was able to get a couple hours of sleep. My plan for the day had been to leave at 7:30am in order to cross the Golden Gate bridge on a favorable tide. So I was up at 7am to prepare and hoist anchor. Well.. long story short, looks like the anchor tangled itself with something very heavy. No wonder it never moved an inch even with the repeated 180 degree windshifts and 20+ knots. I spent three hours trying to raise it. Even had a rising tide to help. Eventually I had to concede defeat and abandon the anchor and chain on the bottom. Wind waves 3 to 4 ft this morning...becoming 2 ft or less. NW swell around 3 ft at 10 seconds. Patchy smoke this morning. The rest of the trip, once I finally got moving, was uneventful. Heavy fog at sea and heavy smoke over land (from the wildfires) meant very little visibility in either direction. Flat seas and little to no wind meant nothing but motoring today. 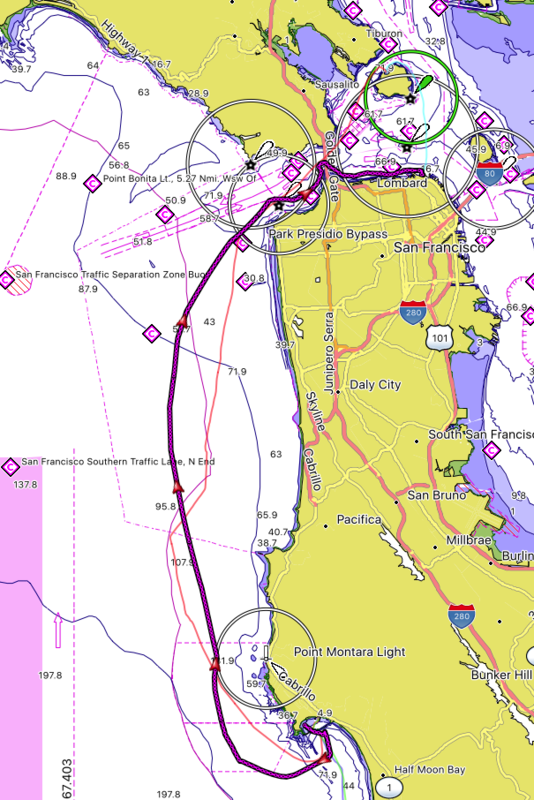 Given the delay in the morning, instead of arriving at the Golden Gate at a moderate flood, I arrived at max ebb, -4.7 knots of current. The current runs strongest in the deep water channel. However, the shallow area just south of the bridge often has a counter current so I tried to hide there on the approach. Instead of -4.7 knots just a few hundred feet to the left, I actually had 2+ knots of counter current to ride, resulting in 8 knots SOG towards the bridge! Nice. Eventually, reaching the bridge, I had to get into the ebb at which point my speed over ground dropped from 8 to barely above 1. Once past the bridge, it was a short motor into Pier 39 where I stayed for the night. Total for the day: 32 nautical miles. 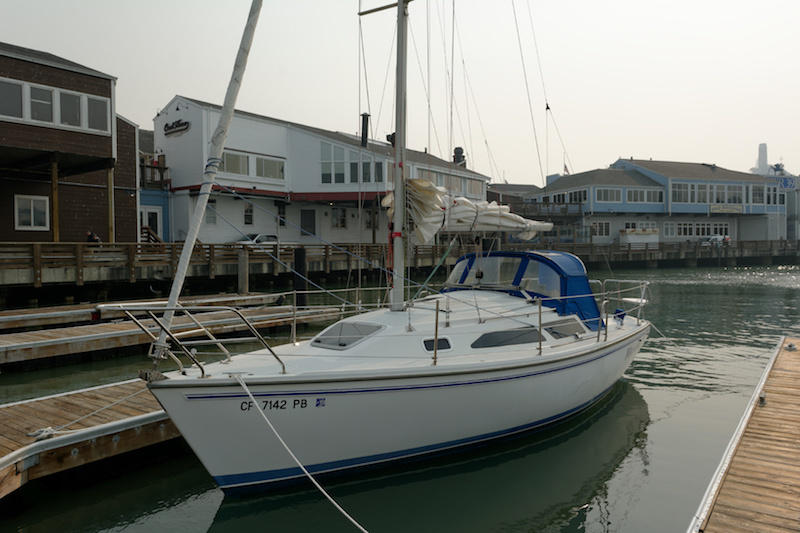 This entry was posted in Sailing by jyri. Bookmark the permalink.